The Danida Alumni Prize was inaugurated in 2017 and the very first prize was awarded to Dr Tedros Adhanom Ghebreyesus, the WHO Director-General. The award ceremony took place on 31 August 2017 as part of Danida Fellowship Centre’s celebrations to mark 25 years in Frederiksberg. 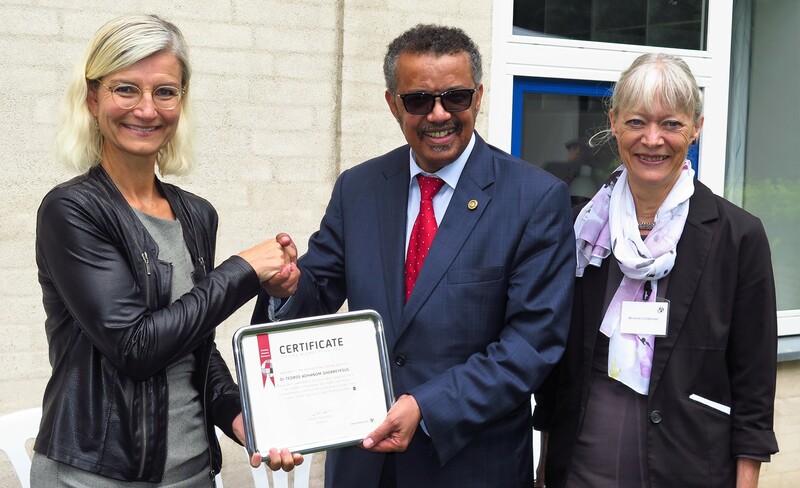 Ms Ulla Tørnæs, Danish Minister of Development Cooperation (left) and Ms Anne Christensen, Director of Danida Fellowship Center (right) presented the 2017 Danida Alumni Prize to Dr Tedros Adhanom Ghebreyesus, WHO Director-General. You can read Dr Tedros acceptance speech, see the photos and read the other speeches from this festive occasion. The Danida Alumni Prize is an honorary award. Dr Tedros Adhanom was presented with a silver framed Diploma of Honour and a Georg Jensen Cobra vase.